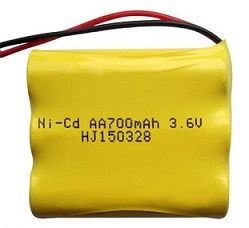 3N700AACW: 3.6 volt 700mAh AA NiCd battery pack with red & black wire leads. Made with 3 x AA rechargeable NiCd cells, in side-by-side configuration. Red wire is POS(+). Black wire is NEG(-). Pack dimensions: approx. 2" tall, approx. 2" across, approx. 0.6" thick.